Saree is an Indian Traditional element that never fades away; instead of wearing a Saree is getting hotter as the time is passing. Saree is so elegant and gorgeous that every woman loves to wear it once in a while. Now the question arises why do you need to look slim in a Saree? Don’t worry I will let you know. A Saree can make you and your body looks gorgeous if worn properly but at the same time, it can make you look like you are drowning in heaps of fabrics, if not worn properly. It is right to say that not every Indian woman is blessed with a good figure and a good height. We all have different body structures that cannot be compared with the ones that we see in movies or on the mannequins at the shops. To look slim and tall is a Saree, you don’t actually need to lose weight or bear the pain of wearing heels. We have come up with some amazing Saree draping ideas which can make you look slimmer and taller than you actually are. Also, we have a list of Saree materials that you can choose from to look even toned and better. Scroll down to let’s get started. Press the pleats of your Saree and even the pallu with a soft iron before you wear it. This is done to decrease your body frame and to make you look slim and taller than you are. This idea will even increase your comfort level of wearing Saree. Who doesn’t love prints? I am sure most of us do love prints. The most eye-catching prints are the big ones, but ladies you need to stay away from them. Always pick the Saree which has got the lightest and elongated prints. Light and elongated prints are scantily spread across you Saree that makes you look slimmer and taller than you are. So always make sure to keep this point in mind while you are buying a printed Saree. Draping a saree is not an easy task and wearing it with poise is even more difficult. The most intelligent thing you can do while draping a saree is to tuck in the saree neatly and properly at the waist so that it does not add up any volume around your waist. Pleats look good but also add too much of unwanted volume to the look, so always make sure to that you don’t go for too many pleats. 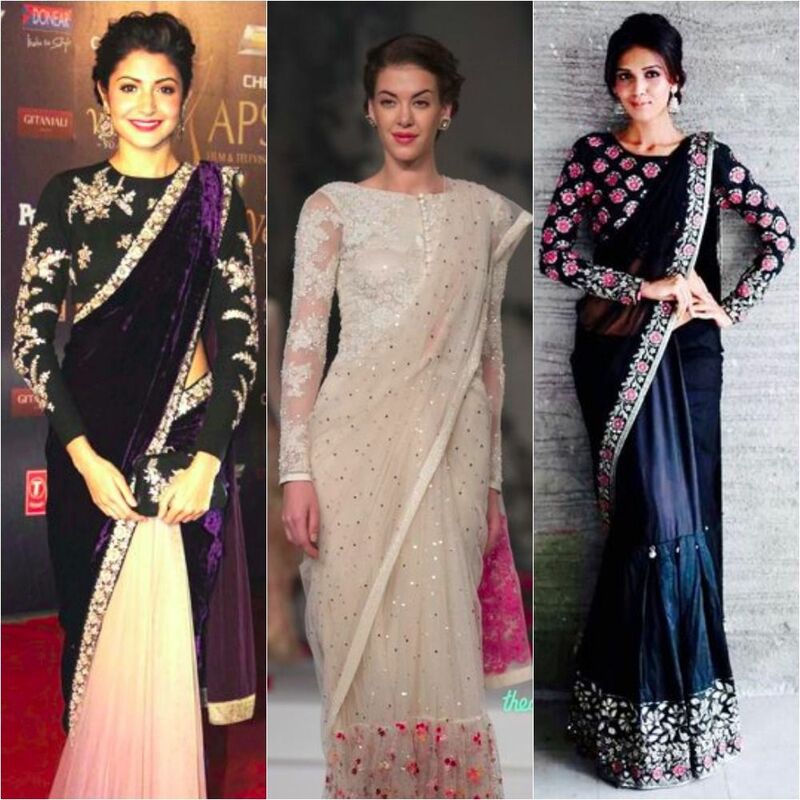 To achieve that slim and taller look, drape your saree tightly all over. This is one of the basic ideas of draping a saree in a right way but yet most of us get it completely wrong. Tie your saree just below your navel in order to elongate your frame as well as this will help to reveal the contours of a woman’s body. Most of the times we get attracted towards the bright and gaudy borders but broad borders will make your frame look wider and even shorter than you are. So always go for the ones with thin borders so that they can flow along your frame and will make you look sleek. A pallu can make a great difference in the look. 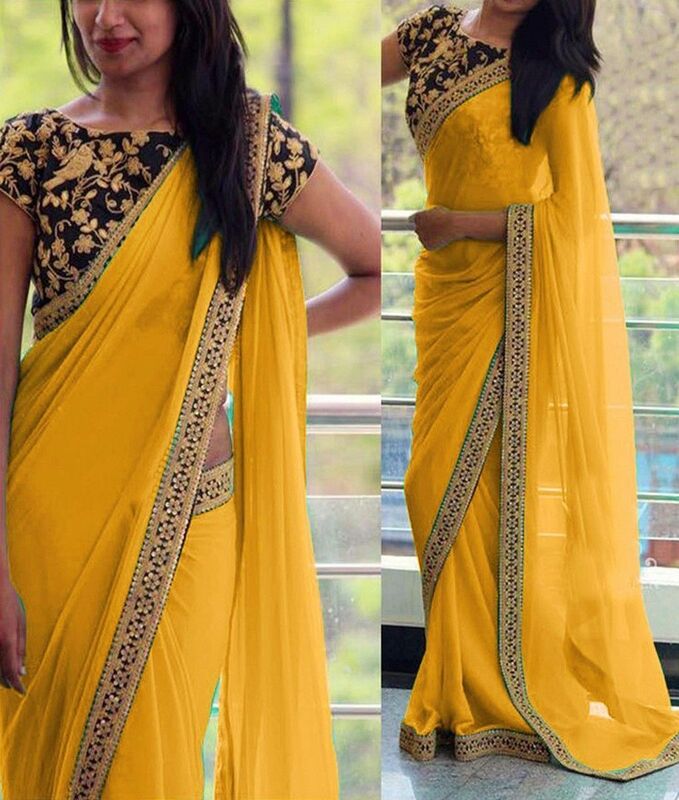 To achieve the slim look, keep the pallu of your saree open and let it fall. When you let the pallu fall from one shoulder, then it hides all the extra bulges of your body and provides you a very elegant look. 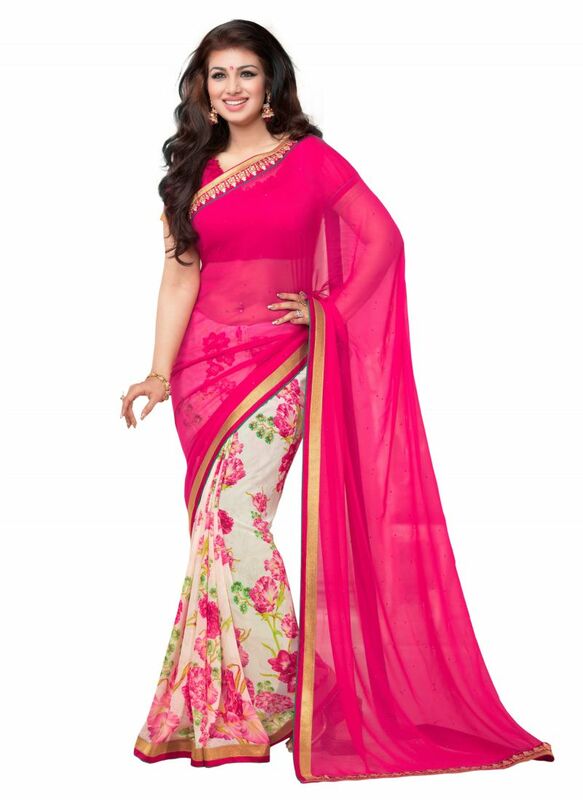 You can also go for the style where you tie the pallu in front to look slimmer and taller. Short sleeves are out of trend nowadays and you need to avoid sleeveless if you have heavy shoulder and arms. So ladies you can go with the trending long sleeves which will lend an air of elegance to your look and at the same time will make you look even taller. Picking up the wrong colors will break your look sometimes. Dark colors are best for women with all body structures. Dark colors conceal the problematic areas of your body while accentuating your assets. When you are wearing a saree, it is very necessary to a have a perfect matching blouse with it as it can make a lot of difference in your look. A blouse that is too loose according to your size will make you look bulky whereas tight blouses are going to reveal your bulges. So make sure to choose the right size blouse for you. Avoid blouses that are sleeveless, off-shoulder, or halter necks as they can make your upper body look heavy. But in case you have very toned arms and shoulders, then you can definitely try these styles to flaunt your body. In case you have a heavy bulky stomach, then go you’re the longer blouses. Also, you can wear a jacket or waistcoats to hide your tummy which will equally look super stylish. Fabrics play a very important role and are the deciding factors on how you going to look when you wear any saree. So always be careful to choose the right material for your saree. Choose those materials that are not stiff and tight since they make draping a difficult task and moreover are not good for a great fall. Avoid fabrics such as south cotton, jacquard, organza and more if you are really willing to look slimmer. Fabrics like georgette, chiffon, silk, and crepe will be your best friends to make you look slimmer. When we say that choose lighter fabrics, then it does not mean to choose anything or everything. Light fabrics may sometimes be transparent which can make you look bulky and clingy. Be it the hot summers or chilly winter, cotton can be worn any time of the day with ease. That’s why women love to wear cotton Saree. Cotton emerges out to be the most wanting material to look slim. But however, it can get a little tricky on how to wear your cotton Saree to look slim. So first point to remember is that go for the lighter cotton fabric that is easy to carry, falls beautifully and doesn’t get cramped way too early. Keep in mind to avoid heavy cotton like south cotton or pure cotton because they can make you look fuller. Instead, you can choose blended cotton fabrics which will definitely help you look slimmer, elegant and breathtaking than ever. Another fabric that all Saree-wearing women love is silk. In spite of the fact that silk looks stunning, it is not the right Saree material that can make you look slim. It definitely makes you look plump. Silk is a very stiff material that is sure to add volume in you pleats and make you look bulky. So the question arises how you can wear silk Saree in order to avoid its stiffness and look slim? If you are really a silk lover, then you have a number of options to choose you perfect material such as cotton-silk Saree, a silk-Georgette Saree or an Italian silk Saree. The right silk fabric makes your body looks toned and will definitely draw away the attention of others from you bulky areas. Choosing a darker color and a thin border can also solve your problem up to some extent and make you look slimmer and taller. So these were the points that you must keep in mind whenever you to buy Saree. bedazzle everyone with your look when they see you in a Saree next time by following all the essential tips mentioned above to look sassy, slim and taller.